Not only is gardening a fabulous way to grow and harvest your own food, but it creates a gorgeous landscape for your yard that you can ‘getaway’ to. And if you aren’t already a seasoned gardener, then you will be pleased to know that gardening can also improve your emotional healthy. How, you may ask? This is because it requires focus. Think of the digging, the planting, the watering, the trimming and caring for flowers, fruits and vegetables – this can all help you still a busy mind. You’re able to instead focus on one thing – gardening and being out in the natural world while tuning into it a bit deeper. It helps you tune out the rest of the world for a while. I love getting my hands in the dirt, and having the smell of flowers and herbs all over my hands. This is aromatherapy at its best! Once you are in this meditative state, your body and mind are able to reach deeper states of relaxation. You’re able to find calmness, peace, and awareness. Once the mind is quieted, thoughts that have been causing you stress and anxiety are sent away for a while. And I generally find that I am able to better address stressful thoughts and situations after tending to my garden. Did you know that there are even gardening programs being used as therapy? Studies have been conducted, and it’s been discovered that people in mental health facilities and even prisons have shown to receive incredible benefits from gardening. Gardening can gift you with a fabulous creative outlet. It stimulates your mind and requires you to problem solve. In addition to planning a garden you also need to pay attention to the logistics. You want to make sure your garden has all of the required nutrients. And if you’re anything like me, you probably want to grow an aesthetically pleasing garden. That means spending time planning not only the location of various plants but how plants work together and fit to create a visually appealing garden. Colors and scents are always a big deal for me. This appeals to your senses which stimulate your mind.Your hands are digging in the dirt, you’re surrounded by the rhythms and movements of life and you’re playing an active role in creating it. You can smell the flowers, touch the soft leaves of your plant and see the vibrant colors! When your mind is stimulated creatively and is involved in problem solving, it can help you learn to manage other things. If you’re dealing with fears, depression, anxiety and stress, gardening can help you learn to manage these sometimes tricky and overwhelming emotions. Sometimes we need to bring equilibrium back to ourselves – pronto. This is a present moment practice which can help you do just that. Out of the many reasons to have a garden, one of the most obvious is for beauty and tranquility. A Zen garden (please see my post here) can provide you and your family with a tranquil escape. A wildflower garden can provide unfettered beauty. My favorite thing to do for the past few years has been to throw some wildflower seeds down into my rock garden, and let the proverbial chips fall where they may! It is then simply my duty to water them, trim them, and weed them. All the while enjoying the natural attraction my little wildflower garden has for hummingbirds and butterflies. And of course, your vegetable garden can provide sustenance for you and your whole family. As with anything, when you have a purpose and can follow through on that purpose, it helps build your self esteem and confidence. It gives you a great reason to get up in the morning! So good for any bouts of depression or anxiety. You can watch your efforts pay off by creating the garden you desire and being a part of its growth and expression. Finally, gardening is so good for you physically. You’re moving your muscles and spending time outside. Time in the sun produces vitamin D, which as we now know has been shown to be essential for mental health. When your body is moving and active it produces endorphins, the feel good hormones produced by exercise. Emotional well-being of course, follows closely behind. 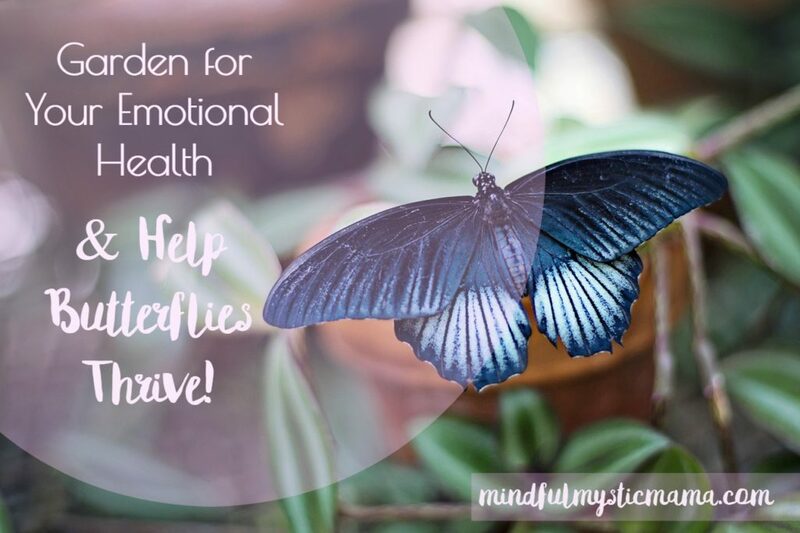 Adding more to my thoughts and pleasure about attracting butterflies and hummingbirds, I want to share with you some ways I have found to keep them hanging around a bit longer. I’ve seen more Monarch butterflies around our home this year than I have in a very long time! I am so pleased. You too may have noticed that butterfly populations have been decreasing. This may be due to a vast number of reasons, but some of the more urgent ones include habitat loss, climate change and pesticide use. We need to pay close attention to doing what we can to remedy this, as like bees, butterflies are very important for pollination! Place a large plate or dish outside with another smaller dish inside of it. Fill the outer larger dish with just enough water to keep ants out of and away from the smaller dish. Take your pieces of overripe fruit and place them on the smaller plate so they are easy to feed upon. 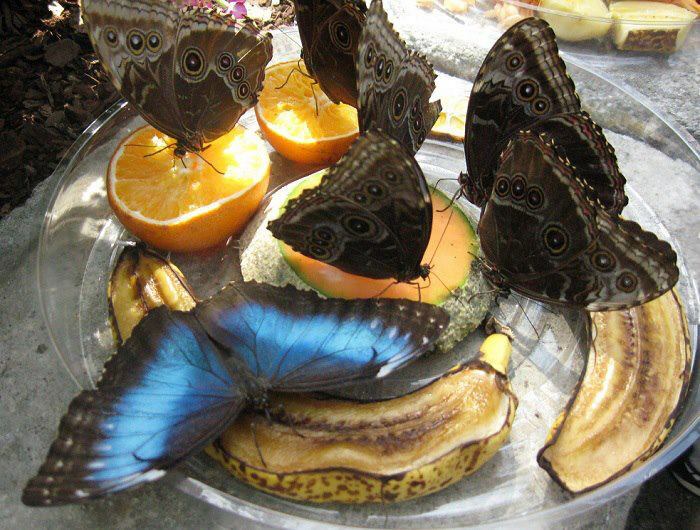 Take care not to crush or squish the fruit so the butterflies do not become stuck inside the fruit pieces. Use fruit pieces you would otherwise toss away and use them on the smaller plate. Try to replace the fruit pieces daily, or when the fruit has started to rot – just no longer than a couple of days at a time. This will help the butterflies thrive. Enjoy!